From day one, the Doberman was designed to do only one thing – put the hurt on bad guys. The Doberman Pinscher was developed in Germany in the 1800s by a German tax collector named Louis Dobermann. He frequently had to travel through bandit-infested areas and decided he needed a fierce watchdog that could handle any situation that arose. 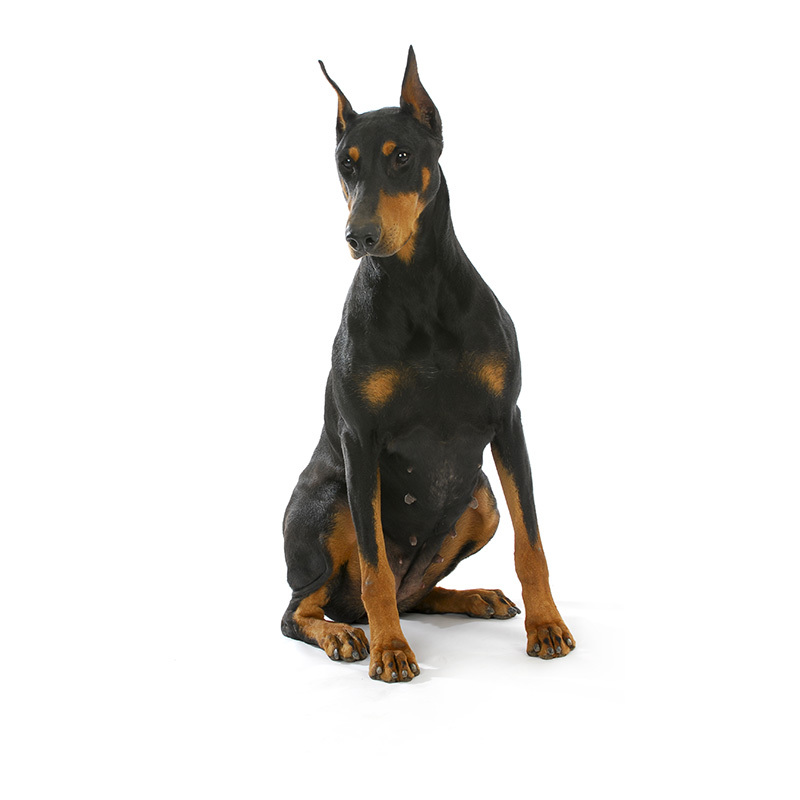 Some of the breeds involved in creating the Doberman Pinscher were German Pinschers, Rottweilers, Beaucerons, Manchester Terriers and Greyhounds. He succeeded in producing a very ferocious breed of dog. Today’s Dobie, as they are affectionately called, is milder than the original version. Even though today’s version is far less aggressive than Herr Dobermann’s original version, they are still protective of their homes and families. Just their mere presence alone is usually a sufficient deterrent to evildoers. However, a Doberman Pinscher in a loving, stable environment is also an obedient and loyal companion. They are “people dogs” and will show you unflinching devotion. Dobies are incredibly intelligent, intuitive, sensitive and perceptive, all of which make them highly trainable. Dobermans are not for everyone, but if you have the time and are able to make the commitment to them, they are highly trainable and can be wonderful family pets, as they are loyal, tolerant, affectionate and dedicated to their family. Doberman Pinschers are ranked 5th out of 132 breeds of dogs in intelligence according to Stanley Coren in his book The Intelligence of Dogs, which means they can understand new commands with fewer than 5 repetitions and obey their first command 95 of the time. Dobermans usually weight between 66 to 88 pounds and stand approximately 24 to 28 inches tall. They are a large dog with a streamlined, well- muscled build. They have extremely short hair. Black with tan markings is the most common color of the Dobie, but red, fawn, blue, and brown are also available. The word “pinscher” translates to “biter” in German. Kurt, a Doberman Pinscher, was a war dog who saved the lives of 250 U.S. Marines on the island of Guam when he alerted them to Japanese soldiers. Kurt became the first K-9 casualty when he was mortally wounded by a Japanese grenade. He was the first dog to be buried in what would become the War Dog Cemetery, and he is depicted in bronze sitting atop the World War II War Dog Memorial. Kurt is among 24 other Dobermans whose name is inscribed on the memorial.